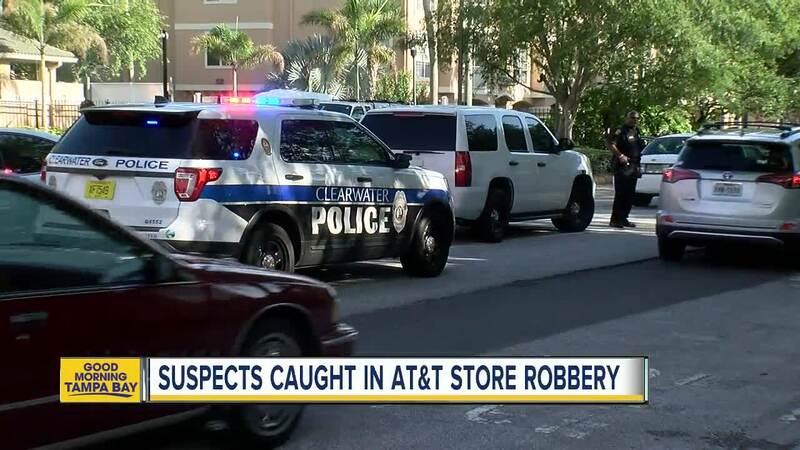 Following an extensive search in the Rocky Point area of Tampa, Clearwater Police arrested the two suspects wanted in the armed robbery of a cell phone store Saturday afternoon. It all started around 3:45 p.m., when police say 25-year-old Dajor Atkins and 23-year-old Anthony Riley held up the AT&T store at 21561 US Highway 19 N. They drove away in a gray Nissan SUV. A Clearwater officer spotted the suspects' car a short time after the robbery heading eastbound on the Courtney Campbell Causeway near Rocky Point. The officer monitored the car from a distance until additional law enforcement arrived on scene. Clearwater and Tampa Police officers swarmed the area around Rocky Point and brought in a helicopter to help with the search. Police searched cars exiting the area and stopped residents who live in the apartments on Rocky Point from getting into their homes. A wedding being held in Rocky Point was also delayed while police searched for the suspects. Both suspects were eventually apprehended but details of their capture have not yet been released. According to Sheriff's Office records, Dajor Atkins has an extensive criminal record in Hillsborough County with arrests for grand theft, aggravated battery, tampering with evidence and possession of drugs.